One Island’s green living programs bring art, food and farms together to help foster connections & build local sustainability capacities – all aimed at improving the quality of life in rural coastal communities. 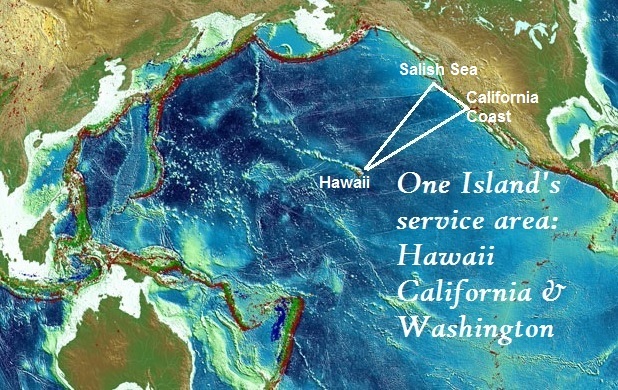 Founded in California in 2004, we’ve hosted programming in Hawaii since 2004 and added services in Washington in 2008. Add in youth and adult programs, health and wellness tie-ins, green technologies and natural resource protection, and we’ve got a full spectrum of sustainability practices that One Island convenes conversations and promotes actions to accomplish. The burning fire that light’s One Island’s efforts is social and environmental change. We are driven to help nurture positive social and environmental change as if our lives depend on it. In fact, we think they do. Where ever we travel and work in Hawaii, Coastal California and around the Salish Sea, whoever we meet with to build collaborative partnerships, we are reminded of the common challenges we face, the vulnerabilities we must prepare ourselves to overcome, and the vibrant native and local cultural wisdoms that have thrived in these beautiful places for many years. of deep, pivotal social changes. We welcome your story and a photo of sustainable living that can be shared through the reply box below. Send us a description and a photo of a sustainability strategy you find most helpful. Or a challenge you are most concerned about. Our editorial group will review and then post on-topic offerings for us all to enjoy.